The first Fix Pack released for UCD+P added initial support for provisioning to VMware vSphere infrastructure along with support for auto-scaling groups in OpenStack. The UCD+P Knowledge Centre topic describes what is currently supported and this YouTube video shows this in action. 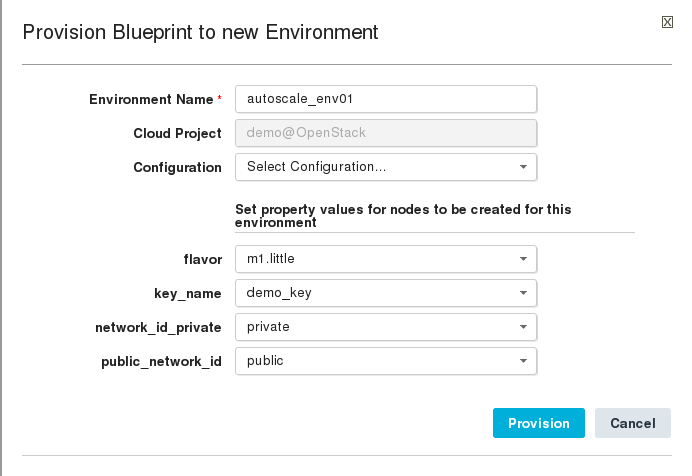 This post works through an example of creating and provisioning a UCD+P blueprint with an auto-scaling policy on OpenStack. Assuming that an Authentication Realm, Cloud project and Team have all been configured (see Security in the UCD+P Knowledge Center), login as a user defined in the OpenStack realm and click “New..” in the Blueprints page. Give the blueprint a name, select “BluePrint” for Type and click Save. 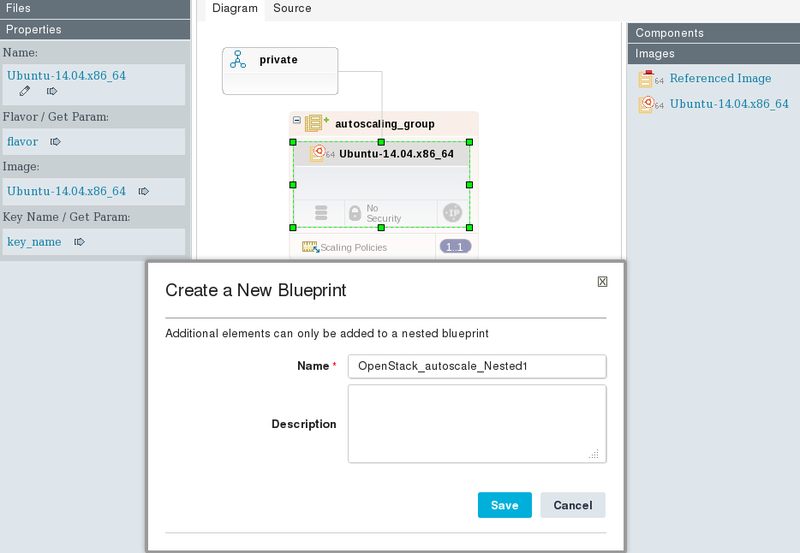 Drag and drop the “private” Network resource from the Network drawer and a “New AutoScaling Group” from the Policies drawer of the palette on the right onto the blueprint. Selecting the autoscaling group shows the Properties, Policy and Alarm settings that can be configured for it. Clicking the Scaling Policies icon will bring up a Policy dialog. Leaving the default policies as-is and changing the Max Size property to “2” will cause the group to add an instance when the CPU utilization on the first instance is above 50% and remove an instance once the CPU utilization on the first instance is less than 15%. Next drag and drop the “Ubuntu-14.04.x86_64” Compute resource onto the autoscaling group and connect it to the private network element. Click the “IP” icon at the bottom right of the Ubuntu compute resource. This will create a new (nested) blueprint to hold the content of the autoscaling group. Save the blueprint, click Provision, provide values for the TODO items and click Provision. The Environments page should show the new stack being created and the initial instance details once complete. Now for the fun bit: stressing the CPUs on the instance to trigger the “cpu_util > 50.0 during 1 x 60s” alarm. and back in UCD+P the Environment details page shows a second instance spawned. By this time the cooling fans are going nuts so a “killall yes” brings the CPU utilization back down below 15% which triggers the low alarm. UCD+P shows the environment back to a single instance and the cooling fans breathe (literally:-) a huge sigh of relief. Currently only the CPU utilization meter is supported but I guess more of the others (from the ceilometer meter-list) will be added in future updates to UCD+P. Previous Previous post: What’s up Doc(ker)?